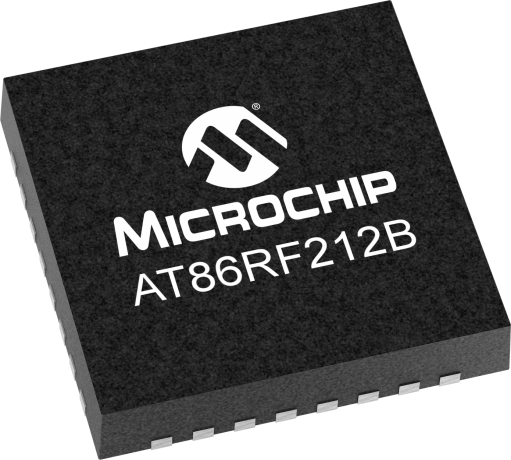 Low-power, low-voltage 700/800/900MHz transceiver designed for low-cost IEEE 802.15.4-2011, ZigBee Pro, 6LoWPAN, and high data rate ISM applications available in China, Europe, North America, and Japan. The transceiver offers an extreme 120 dB link budget (-110 dBm receiver sensitivity / +10 dBm transmit power). It is a true SPI-to-antenna solution providing a complete radio transceiver interface between the antenna and the microcontroller. MAC and AES hardware accelerators improve overall system power efficiency and timing. It comprises the analog radio transceiver and the digital demodulation including time and frequency synchronization, and data buffering. All RF-critical components are integrated on a single chip minimizing the number of required external components to the antenna, crystal and decoupling capacitors. The bidirectional differential antenna pins, used for transmission and reception, eliminate the need for an external antenna switch. An internal 128 byte RAM buffers transmit and receive data. Two on chip low dropout (LDO) voltage regulators provide the internal analog and digital 1.8V supply. This wireless extension board for Xplained PRO is targeted for evaluating the features of the multi-band radio transceiver AT86RF215 in the 863-928 MHz band and the 2.4 GHz band. AT86RF215 is compliant to IEEE 802.15.4-2011, IEEE 802.15.4g-2012, and ETSI TS 102 887-1. This extension board is targeted for evaluating the features of the AT86RF233 radio transceiver. The ZigBit extension boards are targeted for evaluating the features of the ZigBits, currently supporting ATmega256RFR2 wireless SoC, the AT86RF212B radio transceivers. The ZigBit extension board is targeted for evaluating the features of the ZigBits, currently supporting ATmega256RFR2 wireless SoC, the AT86RF212B and AT86RF233 radio transceivers. This ZigBit extension board is targeted for evaluating the features of the ZigBits, currently supporting ATmega256RFR2 wireless SoC, the AT86RF212B and AT86RF233 radio transceivers. ZigBit extension boards are targeted for evaluating the features of the ZigBits, currently supporting ATmega256RFR2 wireless SoC, the AT86RF212B and AT86RF233 radio transceivers. The ZigBit USB stick is targeted for evaluating the USB features of the ZigBits, currently supporting the XMEGA with AT86RF212B or AT86RF233 radio transceivers.